Stepping into a movie world curated by Charlie Kaufman guarantees a visit to the left field of cinema. Often to virgin territory. His is one of the few truly unique voices working in film today. Classic screenplays Being John Malkovich (1999), Adaptation (2002), and Eternal Sunshine Of The Spotless Mind (2004) each took their own distinct journeys direct to the subconscious. Sometimes through, and beyond. To self-reflexive, mind-altering deconstructions of the writer’s and the moviemaker’s art. His latest exudes the usual air of a labour of love. A crowd-funded project, Kaufman wrote, co-produced and co-directed Anomalisa. It’s another exquisitely odd movie world, as delicately crafted as any of his former high points. Before the plane has even begun its descent, an unprecedented tone is struck. An apparently simple stop-motion style, but full of subtle detail, enriched with a hand-made authenticity. The medium might appeal to our inner child, but the message is resolutely grown up. Indeed, later ‘adult’ scenes are disconcertingly incongruous. We are the travel companions of Michael Stone, cipher for Charlie’s trademark ‘flaws’ of self-doubt and insecurity, voiced by a cantankerous David Thewlis. Stone is, characteristically for a Kaufman leading man(nequin), a writer. An Englishman abroad, he’s in Ohio to give a presentation on his specialist subject: the suitably insincere realm of customer service. As we travel by cab, through the rain to the hotel, this peculiar parallel micro-world is expanded upon. The originality is in the exquisite realisation of the mundane detail: the hotel key card not working, the shower running too hot or too cold. Faces are brilliantly expressive, despite being so fundamentally plain. Fundamental plainness is, in fact, the crux of Kaufman’s presentation, for we soon realise that all other faces are identical. More than that, identically voiced. By the soporific, creepily over-friendly Tom Noonan. Stone inhabits a self-imposed world of production line uniformity, populated by indistinguishable clones. That is until he meets the exception that proves the rule. The anomaly. Lisa. The animation is stunning, the lead’s banal paranoia a solid premise. But that only partially fulfils the required formula. And Stone does not make the most pleasant company along the way. Once the disturbing dead-end of his outlook is established, there is little further development. There are a few false starts: his ‘mask’ malfunctioning, a dream sequence. Each teases a trip into the surreal, to revelations we find ourselves craving, to explanations promised by the limitless potential of the animated medium. But none expand beyond the level of hint, so none satisfy. Kaufman’s latest mission to externalise the internal is appropriately dream-like. An ordinary but darkly askew nightmare. Full of insights that are genuinely bleak. Frightening even. He realises that to unearth a statement from the depths of the ego demands a method beyond the norm. Only a hyperreal meta-universe can express such sociopathic frailties. 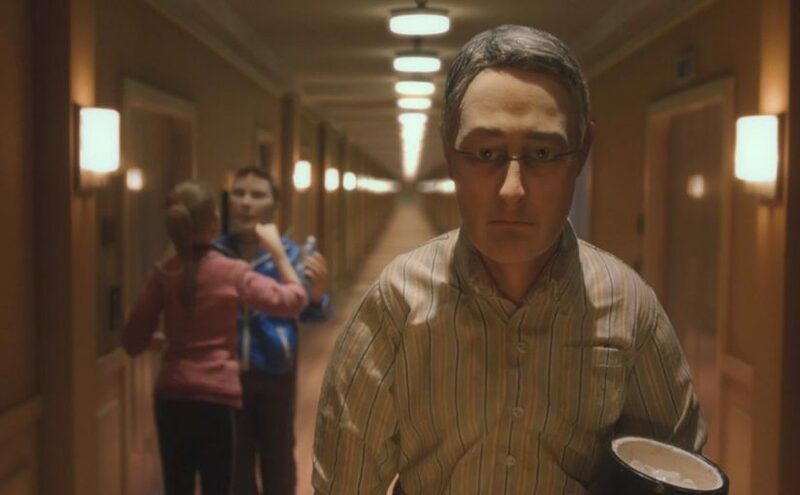 Anomalisa’s high points are sheer puppetry in motion. It is two thirds of a dazzlingly brilliant film. Stone’s potential for psychological meltdown is represented by an incomplete face staring back at him from the mirror. It’s just a shame that crucial fragments of this whole movie’s make-up feel similarly absent.